Below these B&B listings you will also find information about the town of Wigtown and the nearby Isle of Whithorn and Port William. B&B set in a beautiful rural landscape. Double and twin room. All diets catered for. Evening meals available. Good for walking, cycling, history, fishing & golf. Driving along the A75, it is easy to miss out this peninsula - that would be a pity for the landscape is unusual and it contains many of the most interesting relics of Galloway's history. Wigtown is Scotland's National Booktown and you can enjoy browsing the shelves of many specialist bookshops here. 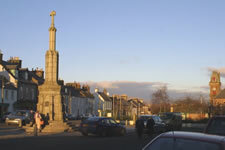 Formerly the medieval capital of the region with a busy harbour, castle and priory, Wigtown was given the status of a royal burgh in 1292. It remained an important harbour, with quays along the River Bladnoch, until the early years of this century when many channels were blocked by silt. To realise how the sea has retreated, look at the stake to which two martyred women were tied, in a place where it would now be totally impossible for anyone to drown. The large square in the centre of the town, with the houses painted in different colours and two market crosses, is typical of the unhurried and friendly atmosphere of the region. For interesting places to go, there is a choice between a martyrs’ memorial on a hilltop with magnificent views, Bladnoch Distillery and visitor centre - a working distillery since 2002 producing a single malt whisky or nearby Torhouse Stone Circle; a bronze age stone circle consisting of 19 boulders. Wigtown is also home to the Wigtown Bay Visitor Centre with live TV images of the Galloway Ospreys and the wetlands at Wigtown Bay Local Nature Reserve (the largest in Britain). The place where St. Ninian founded the first Christian church in Scotland in the 4th Century and site of important excavations, ’The Whithorn Dig’. The Whithorn Story uses models and archaeological finds to tell the story of the town of Whithorn, it's church and pilgrimage centre. On a rocky shore, sheltered by a headland, this was a busy 19th Century port, which also employed a number of men in shipbuilding. Now popular with yachtsmen and providing opportunities for sea-angling, the Isle of Whithorn was believed to be a landing place for St. Ninian and long a place of pilgrimage. A small ruined chapel dates from the 13th Century and is now a focal point for those wishing to bless their wedding. 3 miles south of Whithorn is St Ninian's Cave reached by a short woodland walk and then onto beach. Weathered crosses carved on the walls of the cave are still visible. Set round a bay, formerly a haunt of smugglers and now a popular holiday village (thanks to it's sandy beaches) and home to Monreith Animal World. A memorial to the novelist Gavin Maxwell who wrote ’Ring of Bright Water’ and ’The House of Elrig’, is on a headland. Founded by Sir William Maxwell in 1775, with fishing and shipbuilding trades, but also a noted place for smugglers, where two armed luggers with 50 men apiece were once discovered about to land their goods. Now a holiday place with a slipway for boats.